Everyone hates feeling hungover and bloated the day after New Years Eve, or any big night out for that matter. So I put together a quick meal plan example that focuses on replenishing and resetting! 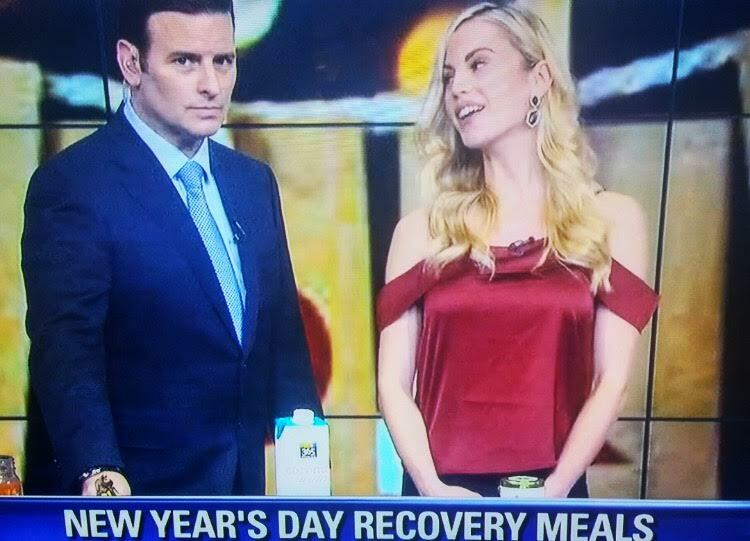 SO – first I discussed various ways that you can cure your NYE hangover on WCIU You & Me This Morning, and today I stopped by Good Day Chicago Fox to put all of those tips to use by creating a meal plan around all of the vitamins and minerals that we want to focus on consuming. So lot’s of information coming your way! Grapefruit juice – I’ve talked about the benefits of grapefruit juice in the past. From the weight loss benefits to helping you curb sugar cravings, it’s a wonderful fruit to add to your diet. Grapefruit juice is also linked to helping your liver function in tip top shape to flush out toxins. This is especially useful after a big night out drinking on NYE! Soup – I never like to follow “dieting” rules, and this is one rule I never follow: eating breakfast foods for breakfast. I say eat whatever you want (anything healthy of course). I love having soup as my first meal of the day and do so quite frequently. Chowing down on soup for breakfast after a night of imbibing though is especially useful because you are replenishing your system with vitamins and minerals that you’ve lost thanks to alcohol. Eating a soup that is plant based will give you a great burst of vitamins. Add a bit of quinoa to your soup to get some protein and complex carbs to get your energy levels up as well. From the protein, fiber, and veggies, you’ll be full until lunch time. You can take a gander at all of my soup recipes here. Bananas or avocados – My go to snack during a hangover is always bananas and avocados since they are both packed with potassium. Potassium is a mineral that helps you flush out water weight that I talk all about it in this post! Coconut water – I always have coconut water with my lunch after a night of imbibing because we neeeed more than just water to hydrate when we are hungover! Coconut water has electrolytes that we are depleted of (which makes us feel even more dehydrated), so by sipping on this for lunch or throughout the day, we are replenishing our system with vital electrolytes to get our fluid levels back in balance. Warm spinach salad – Another key to helping you reset your digestive system after a night of eating heavy or greasy foods is to consume gently steamed or cooked veggies. Steaming or cooking your veggies will make it a bit easier to digest vs. raw veggies. Some of us get a bit concerned about losing nutritional value when cooking veggies – but if you lightly saute or cook them, you won’t lose much. And in any case this is a lot better than eating a big mac, so that’s that. So lightly steam some spinach, top it with chickpeas for protein, some red onion for flavor, and additional toppings of your choice. Matcha tea – I absolutely love having matcha tea instead of coffee in the afternoon since it gives you energy without the jitters. So if you need an extra boost, make a batch of this tea. You can read about all of the benefits in this article too! Vegan eggplant lasagna – At the end of the day I like to have cruciferous veggies for dinner. The reason that I have this food group at night is because they can get things moving in your system (no one wants to feel bloated throughout the day). Cruciferous veggies as I mentioned in my previous article helps your liver function to process all that booze, and it also has a slew of additional benefits like major antioxidant components, and they naturally help us detoxify waste. Eggplants also act as a natural diuretic so you’ll also be flushing out that bloat! In this recipe I use tofu as the ricotta cheese base, but you can swap that out for cauliflower instead to get that cruciferous veggie in your system! Turmeric Milk – Before bed I warm up almond milk and sprinkle some turmeric in there (only 1 tsp). Turmeric will help your liver do it’s job once again and help you break down the fat from foods. It also acts as a wonderful anti-inflammatory so any inflammation you’ve revved up in your body after a rough night out can be combated with this potent spice! All you have to do is blend the two ingredients together, heat it up, and enjoy.